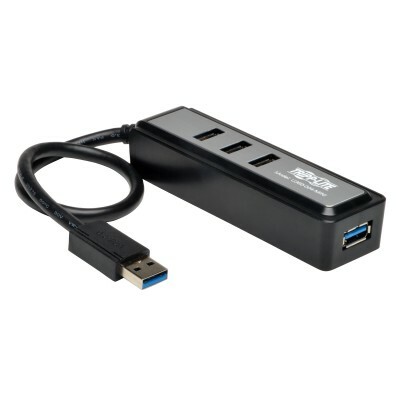 Tripp Lite U360-004-MINI is a compact, 4-Port USB 3.0 SuperSpeed hub, with built-in cable, that provides up to 5Gbps transfer rates in a compact, portable format ( Computer and devices must be both USB3.0 rated to achieve maximum 5Gbps speeds ). Hub is backward compatible to USB 2.0 and 1.1, so that older USB devices can be attached ( devices will run at their native speeds of 480Mbps and 12Mbps respectively ). Small, portable design allows the hub to travel easily, and built-in cable eliminates the need to carry a separate cable for attachment to laptops and tablets. Needed power comes from the attached computer... no need for external power adapter. Plug-n-Play...no drivers or software required. Works with all Windows and MAC operating systems.